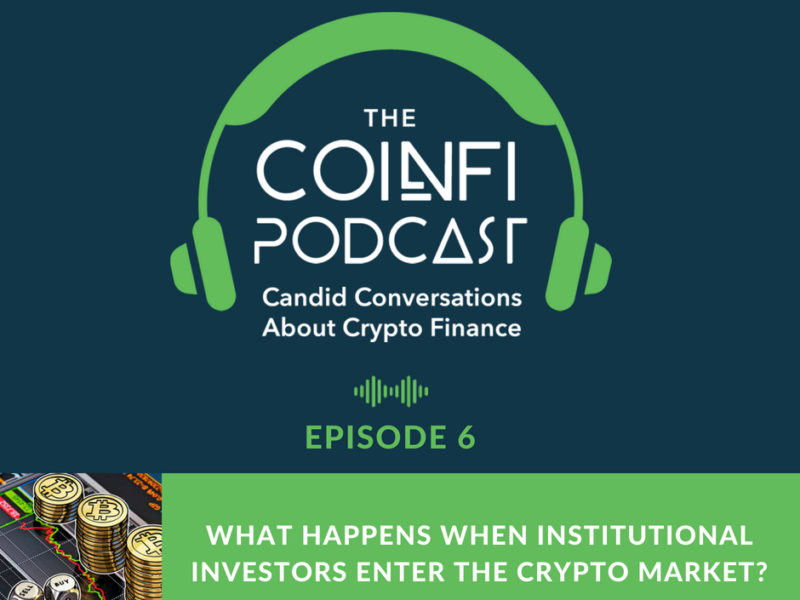 CoinFi Crypto Research - Cryptocurrency Trading Signals - Episode 006: What Happens When Institutional Investors Enter the Crypto Market? All Categories ​>​ Crypto Trading Podcast ​>​ Episode 006: What Happens When Institutional Investors Enter the Crypto Market? Nate Tsang: My caution to listeners is, for people looking at their crypto holdings drop because the bare market, don't pray for a institutional wave to, you know, come in to break $20,000. We might need to do that, but it might be a little bit longer than we think. That's what I'm saying. Welcome to the CoinFi Podcast. We have a lot of random conversations about crypto in the office and we thought it would be interesting to just hit the record button and just riff on whatever topics come to mind. The idea is that you get to be a fly on the wall in the CoinFi office, giving you an inside perspective on how the team members of a fast growing crypto startup look at this crazy new industry. The CoinFi team has an interesting mix of backgrounds, co-founding a hedge fund to launching a Bitcoin exchange in Shanghai back in 2013, to heading algo development for major banks, to managing data science for online brands with hundreds of millions of pages a month. And on each episode, we pull in different team members to talk about areas where they have professional expertise or maybe even just a strong opinion. What's up CoinFi fans? Welcome back to another episode of the CoinFi podcast. Thanks so much for joining us. Today we are looking at what will happen if and when institutional investors enter the crypto markets. I am your host Nate Tsang and with us are two members of the CoinFi team who spent the majority of their professional lives working in institutional investing. Coinfi CEO co-founder Tim Tam and CoinFi's head of crypto research Jonney Liu. Say hi to listeners guys. Tim Tam: Hi guys, this is Tim. Jonney Liu: Hey what's up guys, Jonney. Nate Tsang: Tim was formerly a hedge fund trader with 15 years of experience trading in equity markets. He currently CEO and co-founder of CoinFi. Jonney Liu has 11 years experience trading derivatives. He was formerly a senior portfolio manager at a $350 million volatility arbitrage hedge fund. Most recently, he left his job to join the CoinFi team, working with us to develop signals and algorithms for the CoinFi platform. And both of you are in a unique position to understand today's conversation topic. You both have a deep understanding of the institutional finance mindset and as part of the CoinFi team, and crypto traders yourselves you've also had a front row seat to the rapid evolution of the crypto markets. In the crypto world there's no shortage of headlines whenever wall street makes any sort of move into crypto. But at the moment, most of these headlines are individual executives, and employees of big banks getting into industry. But large institutions themselves have yet to deploy large amounts of capital. The question is will we eventually see real institutional investing in crypto? And when it happens, what can we expect? Tim Tam: Yeah I think is definitely coming, I think the media talks about it a lot more than in actual fact what is happening, I think, you know at my last role, I set up a hedge fund so I remember when were reviewing a lot of legal documentation one of the things is in all hedge funds there's a part of the legal documents that actually classifies what assets that fund is allowed to invest in. So I think first of all, a lot of the hedge funds need to go get special permission on their mandate in order to invest in this universe. Having said that obviously there are a lot of new hedge funds that are setting up that are purely investing in crypto. And then tend to be quite small, and they want more assets on the management, so your looking at anywhere from 5 to 30 million dollars. So they're definitely smaller on the hedge fund side because most decent sized hedge funds have at least one billion under management. I think what's preventing a lot of people coming in, this is my personal opinion, is the ecosystem needs to be a little bit mature and regulated. A concrete example is hedge funds are more concerned, obviously about making returns, but a lot of it is protecting investors capital as well. And they way they do that on the line is by hedging their positions, so one critical component is for a hedge fund to be able to short coins in that way investing in crypto, and there really is not a scalable way for people to do that, obviously they can short on a BitMEX exchange, but that's just one exchange, and especially with all these exchanges not being regulated I think there is a concern for how much capital a hedge fund can employ. Jonney Liu: Talking about BitMEX exchange, I mean they trade quite a large volume so don't you think they can actually cover the exposer there? Tim Tam: Correct, but I think I'm just thinking back in my old role, we went and pitched to investors, they asked what you were trading, or you're trading on an exchange incorporate an offshore jurisdiction that's not regulated. If you're talking about deploying billions of dollars worth of capital, trading through that exchange, I think investors will definitely have to push back on that. Jonney Liu: So you brought up a point about regulation, specifically exchange regulation, and there seems to be a lack of it right? You see some current exchanges now with ties to banks and a lot of them getting more and more regulated. Do you think that's a bad or good thing? Tim Tam: I genuinely think this is a probably a little more on the controversial side, but we actually definitely need more regulation in the crypto market if we wanted to be a viable alternative asset class, and for a more institutional place to come in because regulation itself brings more confidence to the market which will drive more capital coming in. Jonney Liu: Yeah I definitely agree, I think you gotta realize that's just speaking institutions is speaking hedge funds right now obviously there's a lot of institutions. Let's stick with invested money and hedge funds, you need to realize who their bosses are, their bosses are the people that invest in the funds. And like you said correctly, their first goal, obviously, is to make money, but a very close goal is to protect their money, right. Even if there's a 1% chance of them putting a good chunk of money, it's a very small chance and the exchange screws them over, it's such a huge egg in the face and they'll be ruined. So even for them the risk even though they might a very positive expectation value trade, or them to do crypto that small chance of them losing it all and being left out is actually very very large. Actually very very detrimental to them, they'd rather not touch that money, than risk the chance of ruin, right? Tim Tam: Yeah, and I think the reason there's so much capital in the traditional market like equities, and their trading on all these regulated exchanges like Nasdaq is because you've traded with a lot of futures and options, but when you trade a contract, even though you're trading versus another party, the exchange itself guarantees delivery of that contract, right? Jonney Liu: Yes, they guarantee it, I'm just thinking there's a away for them to mess up actually. Tim Tam: Well they constantly under order and boundary regulation and things like that so they have to keep a certain amount of capital reserves and what not. Jonney Liu: So here’s a little bit of debate, it's not to do with exchanges but like in 2008 a lot of banks or even like Long-Term Capital Management, everyone was supposed to be keeping margin for their trades, but Long-Term Capital Management, for those of you who don't know was a famous hedge fund that blew up because it negotiated very very good deals with banks, and the banks said they only need to keep a small amount of margin, but they blew up and everyone was on the hook anyway. For me it's not really, there are chances these exchanges are totally regulated, but the fact is that they're generally accepted. My point is that crypto exchanges whether you like them or not, they're not generally accepted by the public as real exchanges, so if someone was to invest their money and lose on it, it would be very different if, for example, the same hedge fund put the same amount of money in Nasdaq and Nasdaq screwed up and kinda blew up. Jonney Liu: Yes exactly, that's my point right, as in a lot of people in institutions, unless it's their own money and they're willing to go for it, the upside for them is sure they can make a good amount of money but they're wrong, they'll never find a job in the industry again. They will not be able to raise money again, that's really my point, right. Tim Tam: Yeah, I think what's interesting is even though crypto obviously super volatilized that class and I think market cap you're looking at about 250 billion at the moment. We were talking about this the other day but if you look at the hedge fund industry, in the first quarter of 2018, the assets across just the hedge fund industry so not including mutual funds and loan only funds that's already 3 billion in assets. Jonney Liu: You mean 3 trillion? Tim Tam: Yes, sorry, 3 trillion not 3 million, 3 trillion in assets and if you look at what currently there are, quote unquote, crypto hedge funds I don't think there's official assets under management numbers, but I mean I think I was reading in 2018 there 225 new crypt funds in 2017 at the start there were only 17. So let's round that, let’s call it 300 funds and they're roughly, we definitely know based on our own data points, most of them are on the small side, so if you say that even generously call it 20 million, so 20 million, 300 funds, you're looking at 6 billion under assets so if you look at this tiny amount of what the current crypto market is and if the crypto market hedge fund industry becomes even a small proportion of what the equity hedge funds industry is, you look at it, it’s like 3 trillion versus, just mark up to 50 billion, do you think there's a lot of upsides from that with money flowing if we can fix some of these regulation issues? Jonney Liu: So obviously I think if hedge funds institutions generally accept crypto as legit, and they're willing to pour their money into it, then of course the money will drive the prices up, I think it'll be great, but it's a little bit of a chicken and egg, right. A lot of people, currently we're seeing kind of a bear market with crypto right now with the average prices coming down, but there you have a lot of people waiting for the white knight to come in, which is this institutional investor. Everytime a Goldman Sachs news report comes out and says, Goldman Sachs is looking at crypto, everyone gets very excited. But at the same time my point is that they're not gonna come in until they know it's regulated and they're not going to take that reputational risk. They need more regulation, but on converse side, too much regulation seems to spook the market out a lot. Last week we had bitFlyer who sent out the KYC notices, and it kind of spooked everyone out because it meant that there's more regulation coming in and for me it's kind of a catch-22 because you need more regulation, which means that the market might drop initially but these things a puzzle as always. Jonney Liu: Yeah drive confidence right? Tim Tam: Yeah drive confidence. Also, like you said it's a chicken and egg because these guys stuck their neck out and now they're getting buried with paperwork. Jonney Liu: So would you agree that their futures launch was a failure or was it a success? And what do you think about it just by itself versus was it necessary as a necessary step for institutions? Jonney Liu: Yeah, so that's exactly where I'm going back in the idea that institutions having egg on their face, I agree with you them taking their, going outside of the comfort zone or outside comfort zone, but these diving into crypto was a big risk in part and actually I agree with you in a sense that it was kind of a failure but it's necessary for whole ecosystem for people to take that step right. You just hope that the next steps institution comes in it's a lot more successful such that it becomes more generally accepted and therefore people will come and start pilling in and realize hey this is amazing right. Tim Tam: I think the other thing which is that we have kind of spoken about in the office is we also need a fair two-way market where people can bet, whoever has a bullish view can bet and whoever has a bearish view can also bet as well and all those products are available in the equities market but, I think what's interesting it, we've touched on this earlier, but if you want to take a bearish position on Bitcoin or ETH, I mean on Bitcoin you obviously can do the futures, but on most of the coins even something like any other coin in a large top 20 name even Stellar Lumens or EOS, they're are some futures available but most of them don't have futures and even if outside Bitcoin and if they're into futures aren't that liquid meaning that it won't trade that much so if someone were to take a large opposite bet on say an altcoin, it's pretty much impossible to do, I mean what's your view on that where in my eyes there's really no two-way market you can only bet one way that the coins are going to go up. Jonney Liu: Well I mean obviously in a mature market you need to have both sides available, but back in the day, even in some countries now you're unable to short anywhere else. So is it necessary for a market? I mean I don't think it's necessary because we have a market already with people trading. Tim Tam: Sure, but is it necessary for a hedge fund product? Jonney Liu: Is it necessary for a hedge fund product? I think so, because I mean basically the futures, it's also much that you need to short you need to make sure that people can find the end balance, so therefore you need a short, but on top of that look at some people might or might not know, people with a little more advanced financial knowledge know that having a future and having a different maturities of futures will also price out the term structure, and then therefore people can apply interest rates and it becomes a whole new market, a derivative market from Bitcoin itself. Just like we have treasuries and all these little things like SMP futures that run from different months and stuff and lucky to apply a lot of things there. Tim Tam: I guess if you want to talk about it a little bit more because I think it’s super interesting where you can explain term structure and, I mean, there's a little bit of that already with BitMEX, where they have different months expiring for futures, I mean what is term structure? What is the implication? I mean what do retail investors. . .why should they pay attention to something like this? Jonney Liu: So a lot of people who look at Bitcoin, they look at the spot price. The spot price is the price of the physical commodity. In this case it’s digital, but traditionally it was an agriculture product or even oil, for example, and the reason why we have futures is because there was a lot of old producers back in the day just like we have Bitcoin miners now who wanted to hedge out their risk. So then they would say, “hey in the future, I'm willing to set my price and sell it to you at this price against someone else” and therefore they could allow themselves to run a business. And just like we have today, there's miners out there who, maybe in the future, want to set a price to reduce their risk overall and because you have multiple contracts that means that we can figure out what is the cost for holding this inventory over time. And that is pretty much the term structure. So Tim, you were talking about earlier how family offices were also considered institutions as well, they are one group that's been jumping in. Why do you think they've been jumping in versus other institutions which are larger? Tim Tam: Yes, that's a great question Jonney. With family offices the reason they are able invest, for those who don't know family offices typically private money from high end working individuals or very wealthy families where they give their money to professional investment managers or they hire professional managers in-house to run their family's wealth. The reason they are able to get into crypto much faster is typically they are traditionally able to be more nimble when it comes to making investment decisions, so if they see a good investment idea they can typically jump in and they don't have to worry about the rectifications as much versus traditional. Jonney Liu: But a hedge fund is also supposed to be nimble, so what is the difference? Tim Tam: That's a good question, I think the difference is family offices have more of a risk at the time to make money and they can take more volatility in their returns. They really care more about. . . it's their own money, and I think typically as long as you, you really only have one investor, which is the guys' money, so as long as you pretty much have verbal agreement on buy in from him. Tim Tam: Or her, then you know that risk appetite as long as they signed off on crypto, and they know what they're going in they can typically go in. Where is if you’re a hedge fund, you have lots of investors and trying to sell that to many people. And especially when it's something that's nontraditional that's untested that has all these challenges that we talked about and like regulation, we haven't even talked about custody and other huge challenge that a lot of institutional and traditional investors will ask about. Tim Tam: Exactly, or they have to start a new fund where they have to raise new money for which becomes a nightmare for more people. Whereas I think if someone was working a family office they saw a huge investment opportunity in either a ICO or even by buying Bitcoin, in a way, work is out get bring that idea in terms of returning their investment committee and as long as they have buy in from senior management, the founder, or the person who actually has all of the money and can typically proceed very, very quickly. Jonney Liu: So right now we have family offices, next do you think there's going to be hedge fund and which institution is going to be a last pillar to kind of accept this is a investible product that they can hold large amounts on money in it. Jonney Liu: Banks and hedge funds will probably come at the same time right? Tim Tam: Yeah, banks but when you say banks it will be the prop trading desk of the bank. The ones that are more nimble as where I think there's a difference where a lot of what's going on in the press when they say Goldman’s coming in, they're pretty much setting up like a CC product for people to invest in. So they're in the business of packaging Bitcoin and making it easily investible. Jonney Liu: But they're not investing directly in or are they might be I don't know. Tim Tam: I think they maybe invest a separate division, I mean it gets all mudded up in the press they have one area where there basically selling the product to their clients, and an area where they're maybe doing some private trading. And those trades would be fast, I think finance people are quite optimistic when they see a potential to make money, they usually jump pretty fast, and I think people can sense that in this space that's why a lot of finance people actually invest personally even if they can't do it in funds. Jonney Liu: Yeah cause they see that it's something right and Goldman usually are the fastest in terms on innovation even though they have a huge reputational risk of doing this, but I think for them they always try to see how it goes. Tim Tam: Yeah so for private trade desk and then hedge funds and then after that I'll say it's more the sole space which is the traditional long on me asset management that they expect, the need get all this sign off on custodian issues because they usually deploy a much larger amount of capital and then finally it will be the pension funds ones that are in charge of retirement money that alliterated some portion to. Jonney Liu: Where risk tolerance was much less, right. Tim Tam: Who were trying to make like five the second year and cannot lose money at all because it's retirement money. Jonney Liu: But usually by then I would say Bitcoin is already considered gold if that ever happens, right? Tim Tam: Sure, but even the way they do asset evaluation right now they'll allocate a tiny proportion into alternative assets, private equity, all these are something to be seen, so I think they may do it or at least it will just be a small allocation early relatively form them. Jonney Liu: It's really funny because I totally agree with you in terms of the order that's gonna come but for example, Fidelity, didn't they recently hire some guy to build exchange? Jonney Liu: They're increasing it but they're not going to put their money into it, I don't know it seems like they're kind of in between or something. Tim Tam: And again this is my opinion. Jonney Liu: it's a debate. Tim Tam: I think Fidelity and even Tiger, these traditional investment arms, they see so many people have made money in tech over the last few years they actually have a are where they invest BC. Jonney Liu: Yeah I’ve seen it. Tim Tam: So with that exchange I just thought I would go ahead and tell you about it, maybe it's separate innovation possible. Jonney Liu: That's true. Excess cash and then cash and they want to see what they can make out of it right? Jonney Liu: So I mean I guess for me the last thing is like how long, because right now we talked about, we almost talk as if it's going to indefinitely happen, but I guess people might want to know from our point of view how long it's going to take before serious money starts flowing in. Tim Tam: If I had to guess, actually let me ask you first how long do you think? Tim Tam: I think it's gonna take longer, I was thinking two at least three years, but having said that institutions coming in versus creese action I think it's different thing, the market is always forward looking, you just need a real sense that real players are looking into entering the market and they honestly. . . it takes them two years to execute but once there's confirmation data price is gonna skyrocket because the price will move ahead of what actually people do. You look at CME and Cboe futures is a classic example, of course that's only one component. Jonney Liu: I think the market got a little too excited. Tim Tam: But basically when it got announced, before the announcement day when there was true markets already lifting. Jonney Liu: Can you imagine we were 20,000 now we're 6,000 right. So it's already decently off the highs right. Jonney Liu: I guess that's the risk you take when you're in crypto. Nate Tsang: That's great place to end it. Thanks for taking your time to share your thoughts guys. Nate Tsang: Thanks for listen everyone, we hope you got something out of this conversation looking at the future of institutional investing in crypto from the point of view of two professional traders who spent the majority of their careers at institution finance. Thanks to Tim and Jonney for taking time out of their busy day to share their thoughts. Be sure to hit subscribe and we'll catch you guys next time on the CoinFi Podcast. Thanks for listening to the CoinFi Podcast. If you enjoyed this discussion and want to hear more, we'd really appreciate it if you took a moment to leave us a review on iTunes. That helps others find us and lets us continue to record more episodes for you guys. If you don't think the podcast is worth a five-star review, we'd love to know why, so we can improve for next time. Please hop on over to coinfi.com and leave us a comment. We'd love to hear how we can do better next time. If you're still listening at this point, you might be wondering what exactly CoinFi is. CoinFi is a market intelligence platform for crypto investors, powered by the COFI token, which is available for trading on kucoin.com and gate.io. To find out more about the CoinFi platform and the COFI token, go to coinfi.com/about. Also, keep an eye out for the launch of CoinFi News. CoinFi News gives crypto investors like you an informational advantage. Be the first to know the news that moves the markets, including when a token gets listed on a new exchange. To get early access to CoinFi News, go to coinfi.com/news-beta to sign up as an exclusive beta tester when the product launches later this summer. We're only accepting 500 beta users, so sign up now to reserve your spot.